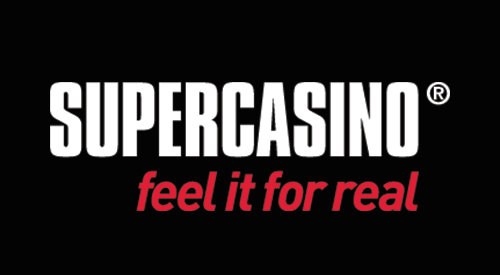 Since its launch in 2005, SuperCasino has grown to be one of Britain’s - and now the world's - most popular online casinos, creating a unique fusion of telly-based gambling and an innovative online platform. Despite it's origins in television, SuperCasino has used the last decade or so to establish themselves as one of the top players in the world of online casinos. SuperCasino has chosen industry leaders Playtech as its software provider - which includes it's subsidiaries like Quickspin - ensuring that it is fully equipped with all of the latest and cutting-edge games from this innovative developer as well as games developed in-house. The casino is flash-based, meaning users can play directly from the website, whilst also having the opportunity to play along live using the site’s online streaming service, or by tuning in to Sky channel 862. Typical of a Playtech powered casino, the graphics are second to none. The Hollywood film-based slot games - both Marvel and DC Comic based slot titles included - come complete with slick animations, whilst the generic ones are crisp, with clear betting options making it easy to learn for new players. The table games are at a similar level to the slots with strong animations, lifelike wheels and the use of real roulette wheels in their Live TV games is a fantastic touch. The experience is second to none and gives the player a feeling of being a real casino. In terms of games selection, popular film-themed slots sit alongside more generic options, whilst table games include roulette, blackjack, craps and even sic bo. What really sets this site apart though is its seamless integration with television. Gamblers can play live roulette on Sky channel 862 24 hours a day, before moving over to Channel 5 from midnight to 4 am each evening for live dealers. Users need to register if they want to play for real money, although it's possible to learn the ropes and play for fun without creating an account. Overall, the option to play along live and have access to the latest Playtech releases makes this a top site for the avid online gambler. A player not finding a game to enjoy among the massive, yet unique, game selection at SuperCasino is extremely rare, if non-existent. SuperCasino doesn’t disappoint with its promotions, currently offering new users an immediate £10 registration bonus and a 100% deposit matching scheme. There’s also a whole range of different prize draws each month, including the chance to win flights, iPads & holidays along with more seasonal offers! SuperCasino have made it as easy as possible for users to get accustomed to their site, providing a comprehensive FAQ for new players. Deposit and withdrawal options are clearly laid out, with users able to use their debit or credit cards, as well as online payment services including PayPal, Neteller & Skrill. The only drawback in terms of this is the need to pay a £1.50 surcharge for withdrawals under £20. The site also provides 24 hour support via email, live chat or a free telephone number. Overall, SuperCasino has managed to create a truly immersive experience, with a good selection of games, great bonuses and an innovative TV offering.